Lt. Frank Luke Jr., the first aviator to receive the Medal of Honor, and after whom Luke Air Force Base in Arizona is named in honor of. One of the most enigmatic personalities of the Great War was an Arizona native by the name of Frank Luke, the first aviator to receive the Medal of Honor. Over the past century, many facts have been cited and myths created in regards to Luke. To some, Frank Luke had a rebellious nature and a volatile personality. To others, however, he was a trustworthy friend as well as an aggressive and formidable pilot in the air. Regardless of the controversies that surround him, one fact distinguishes Frank Luke from all other pilots of the war: he scored all 18 of his credited victories between September 12, 1918 and September 29, 1918 - 18 victories in 18 days! Even more incredible is the fact that 14 of these 18 victories were observation balloons. These heavily defended targets were considered by most pilots to be the most difficult aerial targets to attack. Many of the highest ranking aces often avoided these targets, however Frank Luke seems to have made them his victims of choice. Early in the war the German used a balloon design known as the "Drachen", however, even after changing to a more practical design, German balloons were still known by that name. 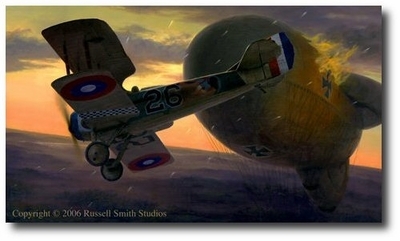 Drachen Slayer is a depiction of Frank Luke�s 6th victory, an observation balloon over the town of Chaumont. Here, Luke dives past the balloon just as it begins to burn itself open from the inside. His report of the Sept 15 encounter reads, "...saw a light about 500 meters. at first I thought it was an observation machine, but on nearing it, I found it to be a Hun balloon, so I attacked and destroyed it. I was archied with white fire and machine guns were very active." Depicted here is SPAD XIII, S15202. Although Luke flew several different aircraft during he September hunting spree, this particular aircraft is most commonly identified as Luke�s. 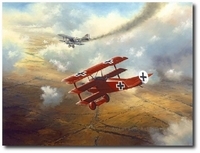 The aircraft bore the number �26� on the sides and the top wing as well as the Eagle insignia of the 27th Aero Squadron. Lt. Frank Luke Jr. Born in Phoenix, Arizona in 1897, was killed, at age 21, on Sept. 29, 1918.